This development board enables you to send SCI commands specified in this document: SCI protocol, the web server application in the embedded web server, roomba.xml, rwr.xml, roomba.cgi and the roomba.json files are examples of how to send commands to your iRobot Roomba in any platform without application installation needed to help software developers to make his own developments using these through the Wi-Fi Interface. If use Gateway mode you are allowed to change the mode of the robot (safe, passive, full) specified in the SCI specification protocol. Be careful and be sure you understood the SCI specification until using this development board. Since you control the using RooWifi or RwRemote v2 described in this document you accept the responsibility of any damage caused on it, on the robot or any external device, furniture or object. 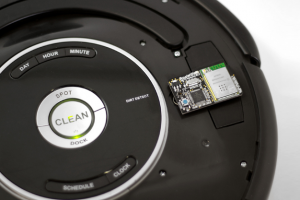 As a development board once you connected this board to your robot the manufacturer of this development board and the manufacturer of the robot are not responsible of any damage caused on iRobot Roomba or other device where you connected the board. Use by your own risk. This device (RwRemote v2 or RooWifi) is a development board with Wi-Fi interface IEEE Standard 802.11 compliant connectivity and mini-din connector with UARL TTL communication developed by Carnlan Engineering (http://www.carnlan.com) and it is a non-official plugin. As an electronic circuit, some parts of the described device could be hot depending of the environment conditions like temperature or humidity when connected. Be sure don’t touch any component over the board when the board is plugged and be sure caching the board by the slim sides of the device (perpendicular to the component solder plane). If any furniture or object lets the robot passing or go under, we recommend to use virtual walls by iRobot around to disable passing under it when you do an action with the robot (Clean and Spot actions in Safe or Passive mode) to be sure that the development board described in this document could not be damaged or any other external component like the furniture, the object or the same robot. This development board is intended for use for ENGINEERING DEVELOPMENT, DEMONSTRATION, OR EVALUATION PURPOSES ONLY and is not considered by Carnlan.com or RooWifi.com to be a finished end-product fit for general consumer use. Persons handling the product(s) must have electronics training and observe good engineering practice standards. As such, the goods being provided are not intended to be complete in terms of required design-, marketing-, and/or manufacturing-related protective considerations, including product safety and environmental measures typically found in end products that incorporate such semiconductor components or circuit boards. This evaluation/development board does not fall within the scope of the European Union directives regarding electromagnetic compatibility, FCC, CE or UL, and therefore may not meet the technical requirements of these directives or other related directives. Roomba robot is sold separately and is not included in the offer. We are not affiliated with iRobot Corporation and that use of this product may void the warranty of Roomba.